Complete your put-together look when you add the Allure Ring to your jewelry collection. Your single 12mm Dot will be shown off by the distinctive antiqued roping framing both the snap and both sides of the band, making it the perfect match for all the other pieces in the Allure line. This is the perfect ring for either dressing up or down! That deep silver finish makes this ring very durable and it stands up to my busy lifestyle. Oh my goodness, this is by far my favorite ring! 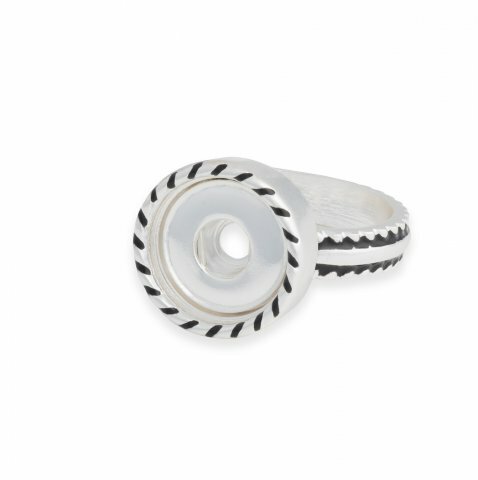 The roped edging allows me to either dress this ring up or wear it with a casual outfit. The Natural Turquoise Dot is my favorite Dot to wear in this ring but I also love my red rope Dot as well. I've become addicted to changing the Dot and changing the look! It is so easy to change the Dots. This ring is also true to size, it fit me perfectly!